It should look good, make me feel good, and as a bonus, smell good. These lip balms by on10 do just that. Playing with a retro vibe and using high quality natural and organic ingredients, they will provide much olfactory pleasure, and they also have a pleasant taste. I have the Hershey’s Almond, which I bought because almond is actually one of my all-time favorite scents, but it fell out of favor with makeup/perfume manufacturers for quite a while. And now I get to smell it every time I slather it on my lips, so that can only be a good thing. These balms are not heavy or greasy, but go on lightly, at least for a balm. With scents inspired by Schweppe’s and Hershey’s, how much more fun could you possibly have? 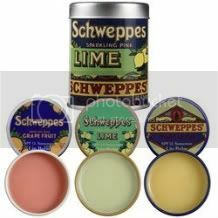 on10 Schweppes Lip Balm Ultra-Moisturizing Trio SPF 15 This trio of retro tins contains Schweppes Pink Grapefruit Seltzer, Tonic Water, and Lime soda flavors. 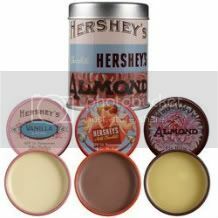 on10 Hershey’s Lip Balm Ultra-Moisturizing Trio SPF 15 Includes three cute tins of Hershey’s Vanilla Creme, Milk Chocolate, and Almond flavors.